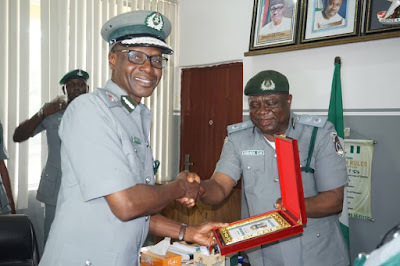 The Nigeria Customs Service (NCS) has assured its officers and men across the country of better logistics packages, which will assist them in discharging their responsibilities dutifully. The NCS Assistant Controller General (ACG) in charge of Zone ‘A’, Aminu Dahiru, stated this while addressing officers of the command shortly after inspecting a guide of honour parade at the command’s office in Abeokuta, the Ogun State capital. The ACG, who is on duty tour of the Ogun Area Command of the service, disclosed adequate provisions have been made for logistics in the 2018 budget. The customs boss stated that once the implementation of the budget begins, issues of logistics, especially operational vehicles, would be addressed earnestly. His words, “avoid whatever will bring disgrace to service. No one should go on one man patrol. Customs service is a well organised service if you allow the rules and regulations to guide you, you will never go astray. “If worse comes to worst, consult your colleague. No amount of rank can stop in consultation because no one has the monopoly of knowledge. “I know there are issues that need attention but all I can say is that the management is on it. As far as 2018 budget is concerned, the issue of vehicle has been taken care of. Very soon, you will all be satisfied”. Dahiru also revealed that the officers of the service would now be subjected to more training and retraining in order to operate according to world best practices. “The service is doing its best and you're squally being developed. That brought about Staff College. The intention is to make customs service a level playing ground for all. You may be here and asked to go to Gwagwalada for a course. “You may not be invited at once so that the facility won't be overstretched. If you support the system, it will work. If you decide from today never undermine to my post. “We have to be good ambassadors of Nigeria and the service wherever we are. While responding to questions and observations raised by some of the officers in the command, the customs boss suggested the command should device a means of interacting more with the local communities. “What I will suggest is that the area should see itself having something to do on that and may employ the services of experts in that area who could communicate in the local dialect. “Now that you've reminded us because of my visit, I will ask the Controller to write a Controller General and copy me so that I can assist in seeing it through. The ACG later in the day visited some of the creeks in Ipokia local government area of Ogun state as well as the first baggage of the customs service in Nigeria.